This is part one of a six-part series on the basics of creative surface embroidery, for beginners and those looking to refresh their hand embroidery skills and knowledge. Creative surface embroidery is the style of embroidery that you see on this site. It’s also sometimes called free style or free embroidery as it is not limited by the “grid” of the fabric (as it is in cross stitch, for example). In other words, it is worked freely across the surface of the fabric. 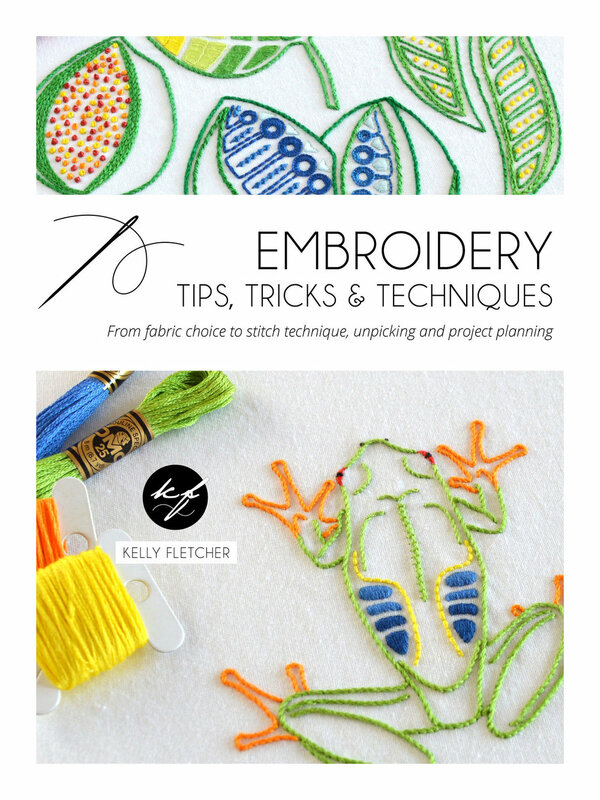 There are many different surface embroidery stitches, which makes this style of embroidery fun and engaging to do, and you only need a few basic items to get started. The two main types of needles used for this style of embroidery are embroidery and milliner needles. Embroidery needles, sometimes called crewel needles, have an oval eye that can hold numerous strands of thread. They come in different sizes and your thread should pass easily through the eye when you’re threading the needle, but not so easily that it slips out while you’re stitching. Milliner needles, sometimes called straw needles, are used for embroidering knots. They’re the same width from eye to tip so they pull easily through the wraps of thread that make up knots. You can see the different needle sizes nice and clearly on this needle size guide. Six-stranded cotton is made up of six strands of thread twisted into one, which you can split up as needed (the embroidery instructions in my patterns tell you how many strands to use). There are various brands of six-stranded cotton available. I use DMC as it is widely available, reasonably priced and comes in more than 500 colours – 489 until recently, when the company added 35 new colours. The Spruce Crafts has links to several thread conversion charts here if you want to use a different brand to the one given in your pattern. 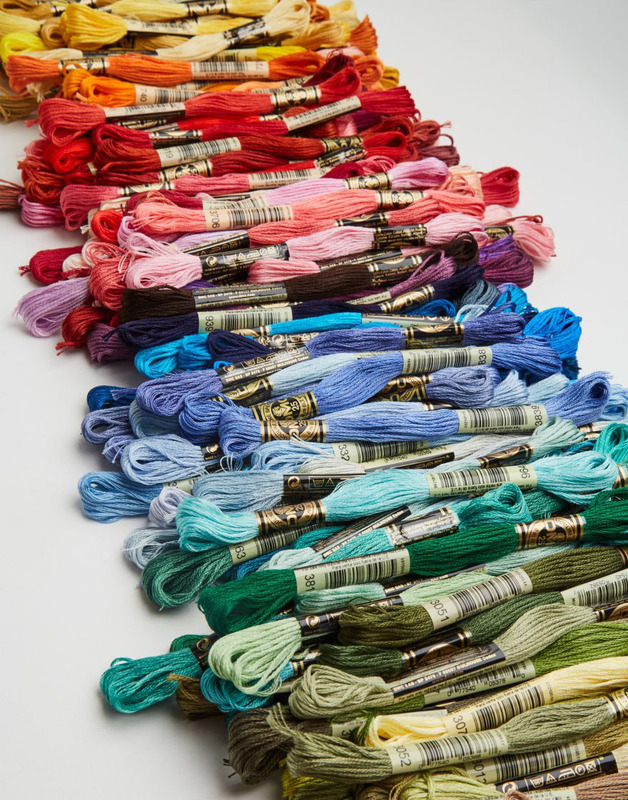 And Mary Corbet talks about six-stranded and other cotton embroidery threads in detail here. Fabric made from natural fibres works best for creative surface embroidery, such as cotton, linen, hemp or blends of these. Blends with a bit of polyester in them are okay, but try to buy the best quality fabric you can afford, especially if it’s for a special project. For more on how to choose suitable fabric for embroidery and info on backing fabric, see part 2. You get scissors that are marketed as being specifically for embroidery, but any small pair with sharp blades and points will do. I invested in a pair of Kai 5100 4-inch needle craft scissors, which work beautifully. An embroidery hoop helps keep your fabric taut as you stitch, preventing your work from puckering. Use a smallish hoop and move it around on your fabric so you can work the stitches comfortably – this style of embroidery can take a bit of squashing. These are the five basic things you’ll need to stitch a creative surface embroidery project. For more detailed info on the items above – and a bunch more tools, supplies, links and tips that make embroidery easier to do, such as thimbles, floss cards and why a screwdriver comes in handy – see Embroidery Tips, Tricks & Techniques.